Discovered in the 13th. century by Albertus Magnus (although believed to have been used much earlier as an alloying addition to bronze to provide a lustrous finish). Arsenic is found in several allotropic forms and has both metallic and non-metallic properties. The grey metallic allotrope is a brittle, crystalline solid which tarnishes readily in air and burns in oxygen. It is resistant to attack by dilute acids and alkalis, but will react with hot acids and molten NaOH. 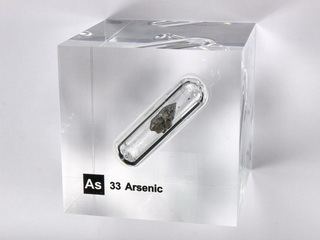 Arsenic is poisonous (it is thought to have been responsible for the death of Napoleon) and occurs both free and combined in many minerals (Arsenic has an abundance within the earth's crust of 1.5 ppm). Applications for grey arsenic include its use as an alloying element, its use in the manufacture of certain types of glass and as a donor impurity in germanium semiconductor devices. The non-metallic allotropes include yellow arsenic (may be formed by rapid condensation of Arsenic vapour in an inert atmosphere) and black arsenic (may be formed by slow condensation of the vapour in an inert atmosphere).